I am completely wild about sharks! Perhaps a little over the top- I brainwashed inspired my daughter to have a shark party for her birthday. Anytime I can fit them in, sharks make an appearance in my everyday life. It was inevitable that sharks would star in my teaching resources… I even have a few shark freebies to share with you! Bring “The Three Little Pigs” to life with this fun STEM activity. Kids will love exploring the science in the story, by interacting with weight and the power of wind. Quick and easy prep + age appropriate science experiments. Hands-on fun with “Three Little Pigs STEM”! I’ve had this post floating around in my head for a long time! I have always loved fairy tales. They are just magical. I love the absurdity and whimsy. One of my favorites is “The Three Little Pigs”. There are so many versions of this story and it’s great fun to read them all. This post shows how we brought “The Three Little Pigs” to life and combined the story with science and math! Last summer, my kids and some of their friends wanted to make a movie. At the time, I was preparing to present at a preschool conference and had all my fairy tale fun spread out in the craft room. The kids saw the three little pigs and the wolf and inspiration hit! They wanted to bring “The Three Little Pigs” to life. I collected a bunch of milk cartons to make the little pig’s houses, so the kids got busy creating. All the houses were very easy to make. We glued pieces of straw to the straw house, we actually used brown paper cut like sticks (you can substitute real sticks) for the stick house, and scrapbook paper that looked like bricks for the house of bricks. The houses were really cute, but I wanted to bring in science. We talked about the various materials and the weight of each material. The kids went outside to collect straw (we used grass), sticks, and bricks (stones). We brought all the materials inside. They filled up each house with the same type of materials. Then, we compared the different weights by placing them on the scale. After we had all of our houses ready, we broke out the very adorable Three Little Pig’s set from Melissa and Doug. They matched the pigs to the houses and got busy working on their script! I forgot to mention the best part of this activity! Break out your hair dryer. It makes the reenactment irresistible. I velcroed the Big Bad Wolf to the top of my hair dryer. Then, he can actually “blow” down the houses. They did end up making their video, but before that we had a great time blowing down the different houses. The straw house was out of there in an instant! The stick house took a little more effort. And the brick house could not be blown down! It was great for discussing the strength and impact of wind on different types of structures. We ended up discussing tornadoes and how they can impact our world. We had a great time engaging with the fairy tale, looking at the science behind it, and creating our own movie! It was a really fun activity and I can see parts of it enhancing a unit on the “Three Little Pigs”. It’s always great to bring STEM into a unit of study on fairy tales, the whimsy of the stories enhances the science and math exploration. It’s sure to draw in all of your little learners. I am in the process of creating a “Grab & GO” set on fairy tales. They are great for writing centers, word walls, use in large group writing activities, identifying and categorizing thematic words, comparing and contrasting elements of fairy tales, and so much more! This set isn’t quite done, but you can see all my other Grab & Go sets here! Thanks for stopping by and I hope you found some fun ideas to use with your kids, too! All In A Name FREEBIES! Kids love to learn about their names! They are highly motivated to explore everything about their name and the names of their friends. 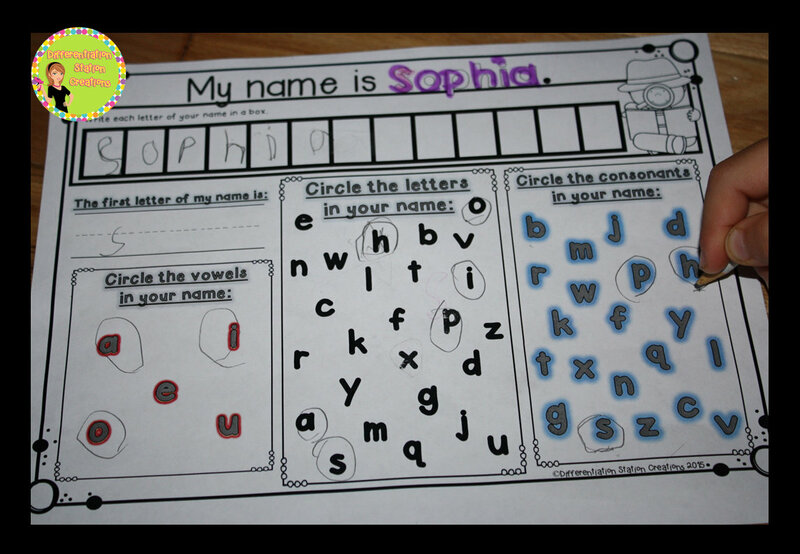 I created some FREE interactive worksheets, so kids can explore many features of names. This freebie is editable and easy to use. There are two versions for the worksheet where they work on their own name and for the “All In A Name” worksheet that works on a friend’s name. Below are the two versions for kids to work on their own name. 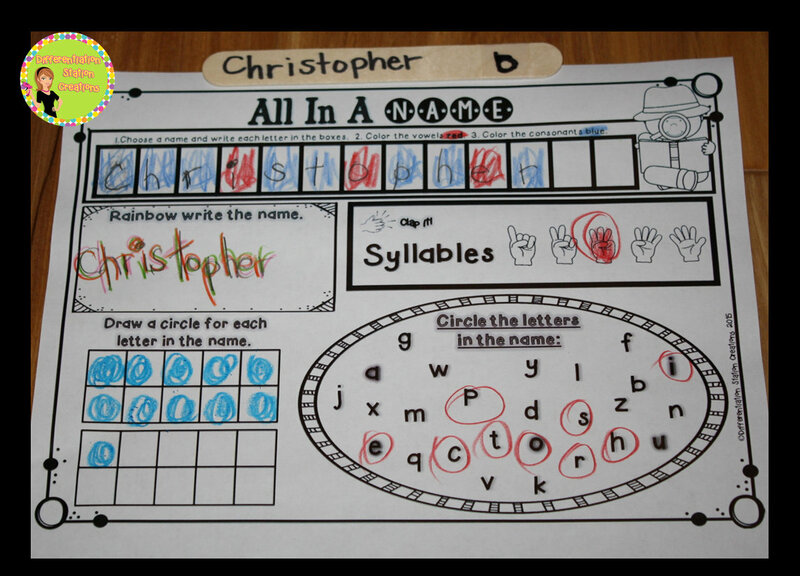 This editable version allows you to type in each child’s name at the top of the worksheet. They are then able to trace the letters in their name. Version #1 includes: tracing their name, writing each letter of their name in separate boxes, writing the first letter of their name, circling all the letters in their name & identifying vowels and consonants. 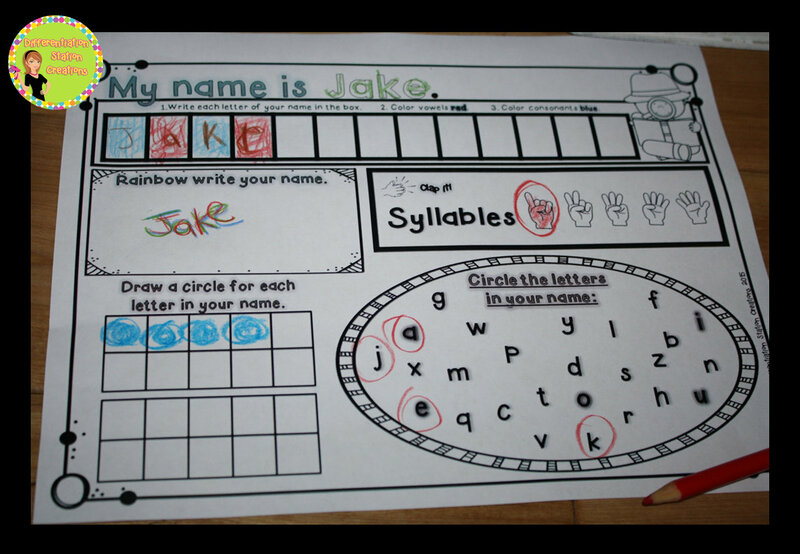 Version #2 includes: tracing their name, writing each letter of their name in separate boxes, coloring the vowels red and consonants blue, rainbow writing their name, counting syllables in their name, counting and drawing a circle for each letter in their name, and circling all the letters in their name. 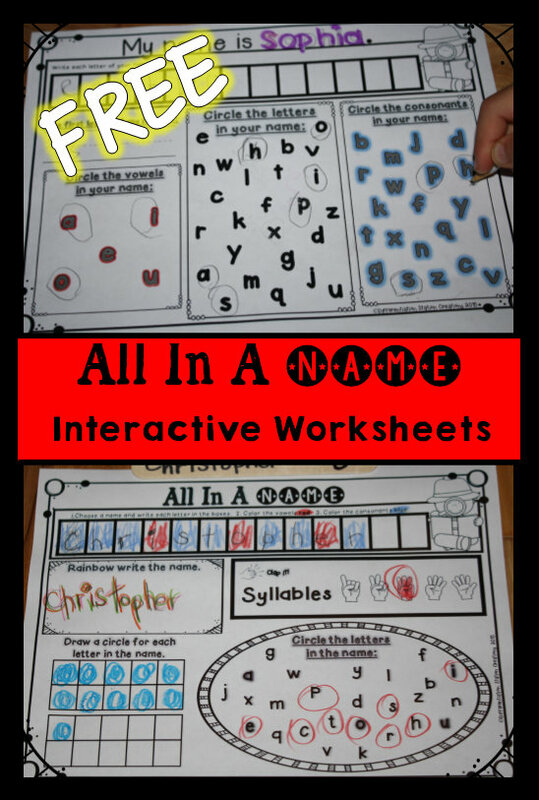 The “All In A Name” worksheet has the same two versions, but these worksheets allow kids to explore their classmates’ names. Just print them out and you are ready to go! Students choose a name from your word wall, written on a popsicle stick or card, or from any place in the room. They will copy the name and start exploring!! Save this image and get your kids exploring!! 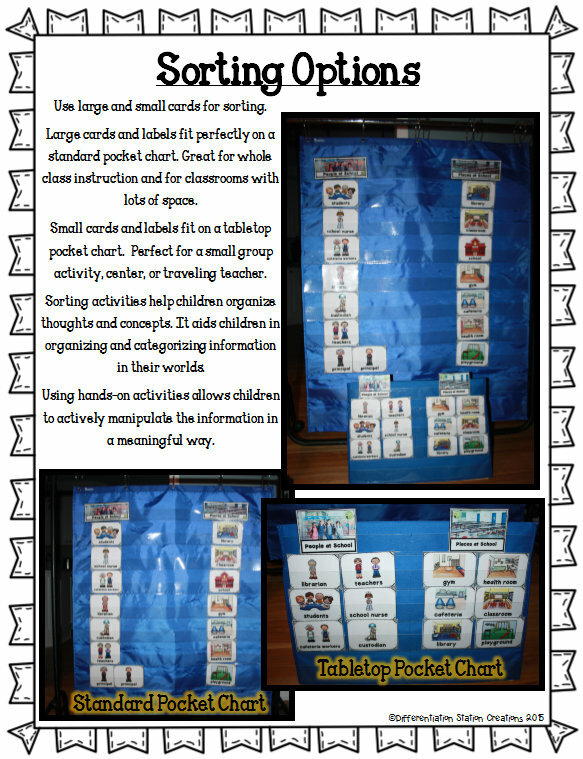 I hope that you find these interactive worksheets helpful! 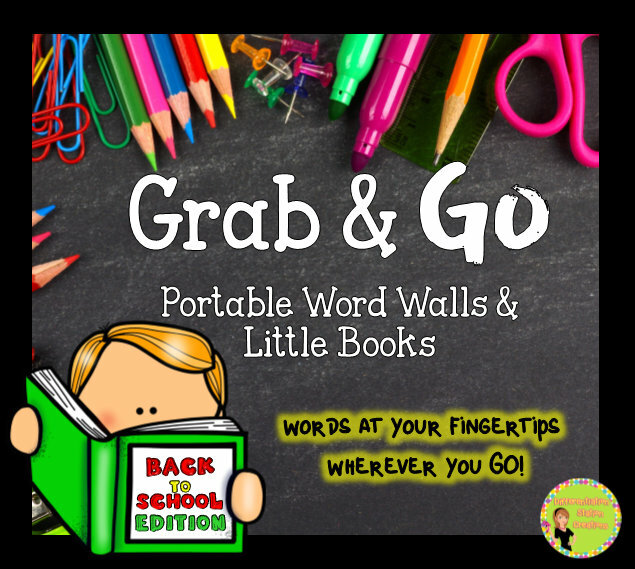 Check out my Grab & Go: Portable Word Walls and Little Books for more resources that help kids explore and interact with words. There is a companion pack that is almost done! 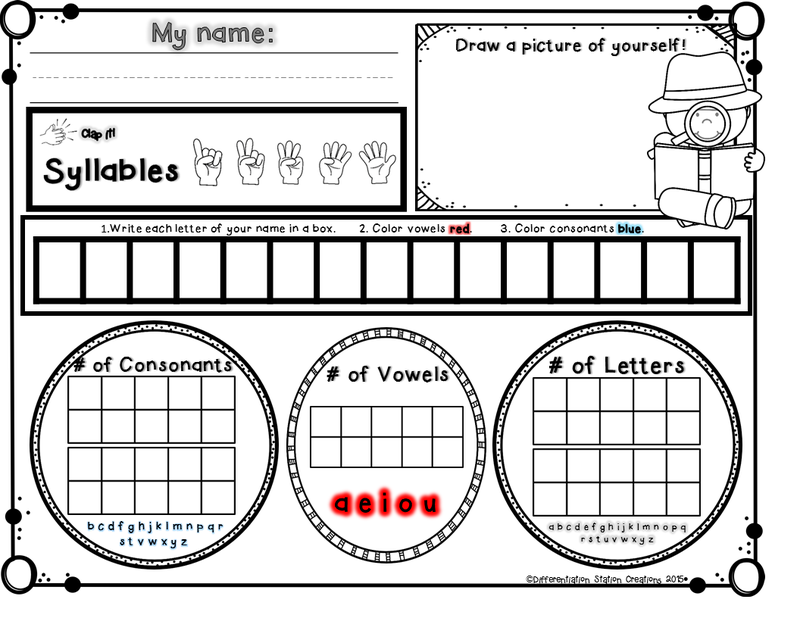 You can use these interactive worksheets in a center, where kids will explore the features of thematic words or sight words. It helps get kids invested and excited about their own learning! BTS Sale and Markdown Monday! Another sale that I love is the Teachers Pay Teachers annual back-to-school sale! 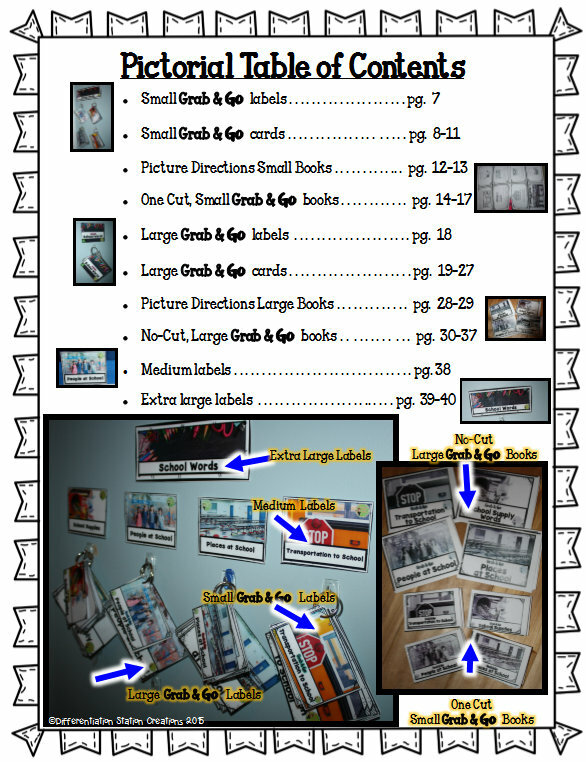 I had tons of great learning resources and clip art on my wish list, itching to jump into my cart. Now the sale is here and I am ready to go! Everything in my store is 20% off for the site-wide sale from August 3rd-August 4th. 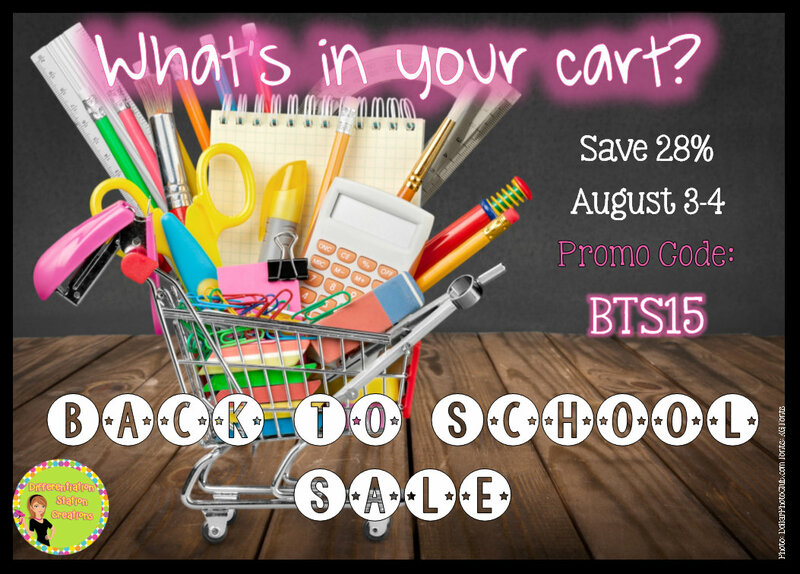 Put in the promo code: BTS15 and get an additional 10% off your cart. Since teachers spend so much of our own money, I thought it would be nice to put together a great collection of back-to-school freebies. Head over to this post to see the Back-to-School freebie link up. 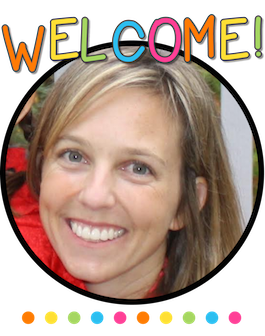 If you have a great back-to-school freebie or blog post, please feel free to link up! Before I go, I had to share my newest creation! I’m sooooo excited about this new set of learning resources. It is definitely my favorite creation to date. I’ve always been a fan of word walls. I think that they are fantastic resources, but I have not always had the space to utilize them. When I was a special education resource teacher, I worked from a cart in a variety of places. I never had one permanent space to utilize a word wall. 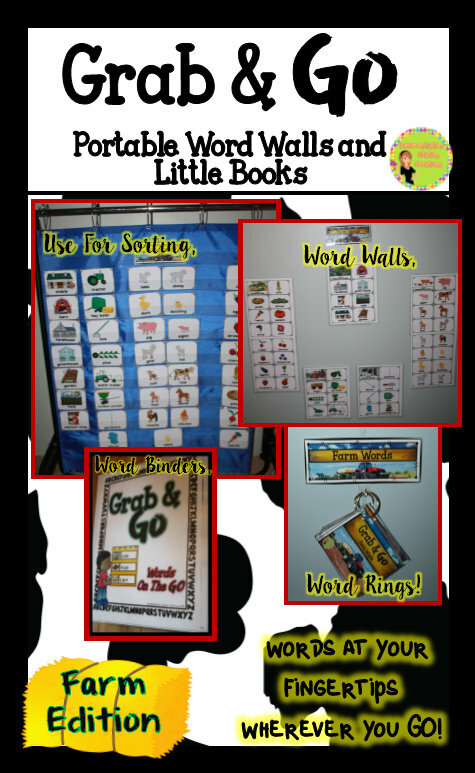 I went through a variety of different types of portable word walls- thematic file folders with and without Velcro, words affixed to my cart, a traveling pocket chart, and index cards in strange places. I always seemed to come back to the word rings. They are portable, yet organized. I like the simplicity of containing all the words on one ring, but the ability to pull it apart and really interact with the same words. I love the way the word rings lend themselves to grouping words into categories. It creates a great visual for kids when you snap the ring shut on a group of words. It was natural that I finally got around to creating my own version of the portable word wall. I’ve been creating this product for about a year. I have printed a number of versions and tried them out in a bunch of different ways. I finally decided it was ready to share. 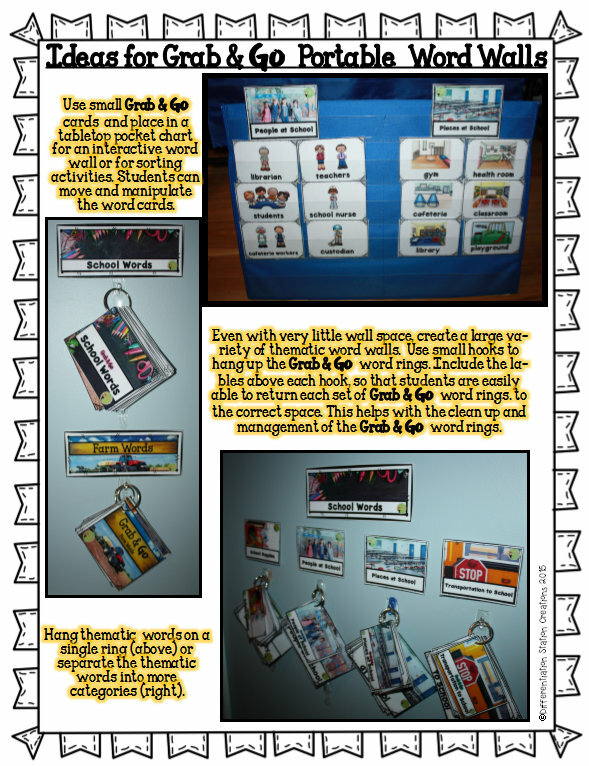 The “Grab & Go Portable Word Walls” are available in a small and large version to meet your needs. Here is a quick look below. You can pick up the “Grab & GO: School Version” for 50% off until the morning of 8/4. Put in the BTS15 promo code and get another 10$ off! I hope that you love it as much as I do. I also would love to take any requests for future editions. I am almost done with the farm edition. Leave me a comment with anything you would like to use in your own class! 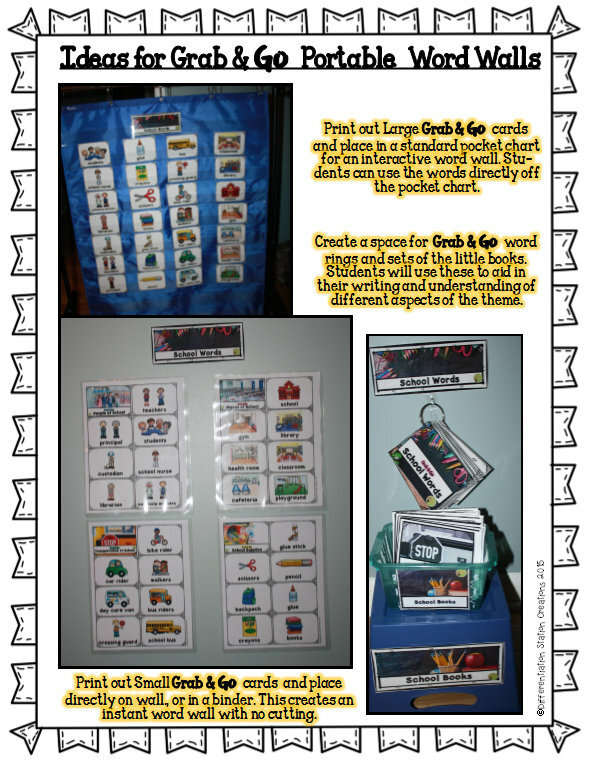 I’ve also linked up with Kelly and Kim’s Kindergarten Kreations for the Markdown Monday Link Up! 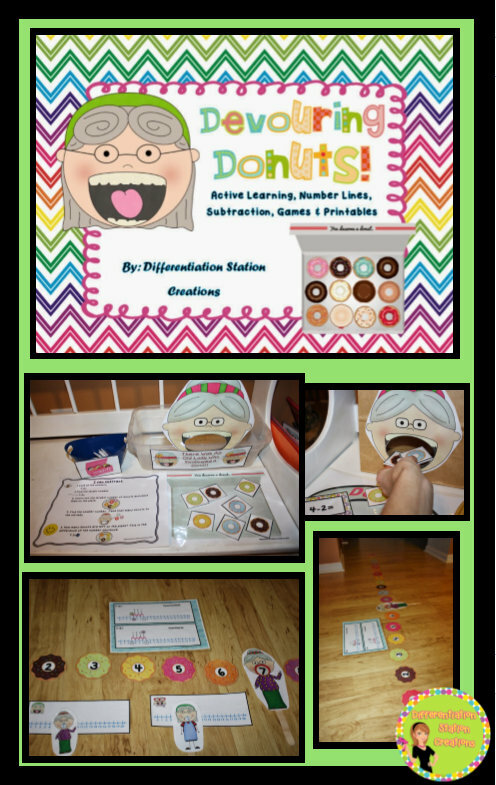 I’ve marked down my Devouring Donuts: Number Line 0-20, Subtraction, and Active Learning pack. You can pick it up now for $3.20 + an extra 10% off with the promo code. That is a steal!